C, C++, C#, Ada, Pascal, COBOL, Mat lab, Java, Python, Basic ,Perl, Python ,Ruby etc. Each language has a unique set of keywords and a special syntax for organizing program instructions. This languages are classified in level according to their working pattern. They are categories in two level. 1) Low level programming language. 2) High level programming language. Low level languages are closer to machine architecture. Low level language are called machine dependent programming language because program written in one platform cannot be executed in another platform. It provides little or no abstraction from a computer's instruction set architecture. Low level language are very hard to understand and program. There are lots of instruction sets and a programmer should understand all of those instruction sets and also available sets of registers and internal computer architecture too. Low-level programming languages are sometimes divided into two categories: first generation (machine language), and second generation (assembly language). Machine language is a collection of binary digits or bits (0, 1) that the computer reads and interprets. Machine language is the only language a computer is capable of understanding. While easily understood by computers, machine languages are almost impossible for humans to use because they consist entirely of numbers. Machine level language is very complex as it has to be written in 0's and 1's form. So there evolved another Programming language to simplify the complexity of programming and is known as Assembly language. Assembly languages are quite simpler then machine language because 0's and 1's are replaced by short abbreviated English words called mnemonics. ADD, SUB, MUL, DIV, HALT, NEG, INC etc. are some examples of mnemonics. It is still slow and Machine dependent. High level computer languages give formats close to English language and the purpose of developing high level languages is to enable people to write programs easily and in their own native language environment (English). High-level languages are basically symbolic languages that use English words and/or mathematical symbols rather than mnemonic codes. Each instruction in the high level language is translated into many machine language instructions thus showing one-to-many translation. Since high level language is not understood directly by machine, the codes and instruction written in this language is first converted using translators (compiler or interpreter). It is independent of the machine and fast that’s why it can be run on any Computer. High level languages are generally categorized into two basic groups, Procedural language or Third generation language and Problem oriented language or Fourth generation language. There is a new member has been added to this level and this is called Natural language or fifth generation. It is based in the concept of modularity. Entire program is divided into different modules, which further consists of different procedures called functions or subroutines. This language focuses on the procedures to find the problems rather than instructions. It is a general purpose language. Keywords are used to write instructions which are more flexible then first and second generation programming languages. Problem oriented language is also known as application specific and is used to solve specific problems. This language is result oriented and lets the user specify what the output should be, without describing all the details of how data should be manipulated to produce the result. Codes are re-useable, have standard math symbols, faster than the third generation language. Example:Python(functional, object-oriented (class-based), imperative, meta programming,functional programming or procedural style),Perl,Ruby,Panther,XBase++,MatLab,SQL,PL/SQL,SciLab,Visual Data Flex, XQuery, XVL etc. Natural language is a concept in modern technology in which instructions are given to the computer as the way much similar to how general people uses to communicate. Example: Prolog, OPS5, Mercury and Backus’s FP. 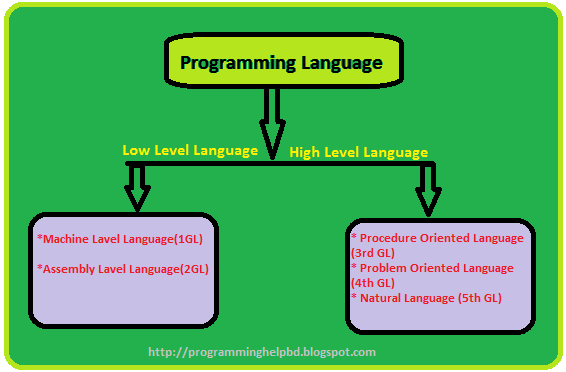 Level of programming languages.programming languages are developing day by day and they are categorized in 5 generation until now In all over the world, language is the source of communication among human beings. Different countries have different languages.